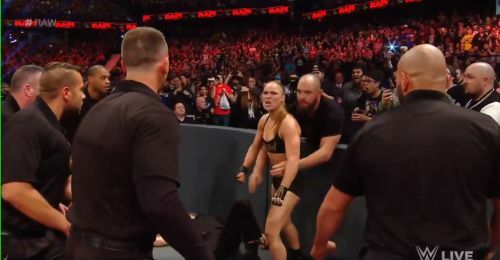 This week's episode of WWE RAW saw Ronda Rousey continue ruthlessly carving her path to WrestleMania 35. On WWE's show this week, Ronda Rousey was set to take on Dana Brooke. She did face Brooke in a match, where Brooke wanted to claim her position and pride back on WWE RAW. Not only did that not turn out quite how Dana Brooke wanted it to, on top of that WWE officials found themselves on the wrong side of Rousey as well as her husband, UFC Fighter, Travis Browne. Ronda Rousey has developed quite the new attitude on her Road to WrestleMania. After a great deal of confusion as to what would happen at WrestleMania 35, it was finally decided that Becky Lynch and Charlotte Flair would face Ronda Rousey at the Show of Shows for the RAW Women's Championship Match. Rousey seemingly snapped a couple of weeks back, attacking Becky Lynch and Charlotte Flair on RAW. She was also the one responsible for Becky Lynch winning her match against Charlotte at WWE Fastlane. Rousey interfered and attacked Lynch, resulting in her winning the match by disqualification, and thus getting added to the WrestleMania match. Many feel that if was Becky Lynch referencing Travis Browne, that caused Rousey to finally snap. Ronda Rousey faced down and dismantled Dana Brooke in a matter of seconds, putting her in an Armbar and getting her to tap out. However, Rousey did not let go, and continued to put pressure on her arm. Finally referees interfered, and while Rousey let go, she attacked the referee. She came out and kissed her husband, Travis Browne, who was at ringside, when she was accosted by WWE Security guards for her actions. She attacked a guard, and when another guard was trying to pick her up, her husband, Travis Browne attacked him. He then proceeded to pick up Rousey over the barrier, and the two of them made their exit. This is not the first time that Rousey has attacked WWE officials. The last time she was fined, and now with her husband getting involved as well, there might be further consequences. What If: Arrest on Travis Browne forces Rousey to retain the title to bail him out.